Notice to users: UBC Pay for Print unavailable November 3 from 9 to 9:30 p.m.
November 3rd, 2015 by Jessica Woolman | Comments Off on Notice to users: UBC Pay for Print unavailable November 3 from 9 to 9:30 p.m.
Posted in General, pay for print, service bulletin, ubc | Comments Off on Notice to users: UBC Pay for Print unavailable November 3 from 9 to 9:30 p.m.
UBC Library’s Innovative Dissemination and Engagement Award (IDEA) is now seeking applications. This annual award, established in 2010, looks at innovative ways of disseminating research knowledge, through the development of tools, enhanced teaching, or making research widely accessible in new ways. Previously dubbed the Innovative Dissemination of Research Award, the IDEA has added community engagement and teaching tools to the award criteria. A lucky UBC faculty, staff or student researcher will be awarded a framed certificate of recognition and a $2,000 cash prize. 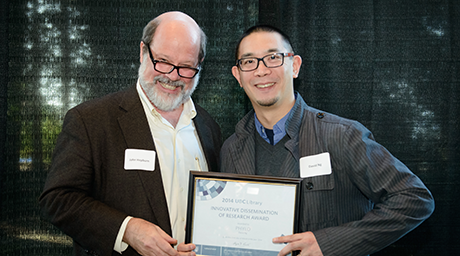 Former recipients include David Ng (pictured below), a professor in UBC’s Michael Smith Labs and Rowan Cockett, a UBC Geophysics student. For eligibility, award criteria, or to fill out an application form, visit the Scholarly Communications website.